Donationcoder - do you know the website? Mouser is a regular here on Ghacks and I had the pleasure to test some of his excellent applications before. Flipbook Printer is another great idea especially for birthdays, holiday season or other occurrences where kids are around.The lightweight program enables you to create flipbooks from avi video files you have on your computer. Best of all, it is really easy to use and work with. After installing the small file a step by step guide pops up which explains the complete process. It gives you information on how to prepare the movie, set the start and end times of the movie and how to create the cover and back of the flipbook that you create in the process. The program interface looks crowded but with the help of the step by step guide you should be able to create a flipbook quickly and without much troubles. Please note that you need to have a printer installed on your system, if you do not, you will receive an error message after which the program will terminate. The main interface is where all the magic happens. It displays a variety of options for you to modify if you want, including a preview button so that you can test how your creation will look like if you'd to print it right now. First thing that you want to do after running the program is to import a suitable video file which you can then play in the program to find the perfect scene to create your flipbook out of. 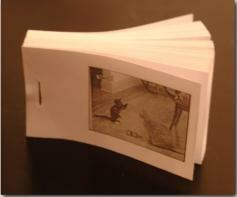 Flipbook Printer offers a great (and cheap) way of creating a special gift for someone that you like. I would say that not only kids but also women would love this kind of present. Update: Note that Flipbook Printer has been superseded by FlipSuite, a program which contains all the functionality the official program had to offer plus exciting new features. You can configure global hotkeys to speed up various program features. It pays to go through the - massive - preferences the program makes available as they allow you to customize the output and other functionality. I suggest you start to print only one or two pages to make sure everything has been set up correctly before you print a larger batch of papers. also: mac and pc users can have their flipbooks professionally printed at http://flipbooker.com/ a company that my wife and I run!